Frequent readers of our blog will know that this is our second article in the past week covering a stock we previously held. As is now what is becoming a custom, we will present the evidence of our transaction first. This is not us bragging. We simply wish to set the bar higher. In the armed forces, leaders lead by example. That is the very reason why some men would go to hell and back with the right leaders. This is something we have not found to be replicated in the financial world for retail investors. Analysts frequently do not buy stocks they recommend. Financial advisers often do not buy policies they would sell you. We find this state of affairs to be utterly ludicrous. If auditors and banks had been forced to buy shares in companies they had deemed had a “clean bill of health”, they might have been far more modest in handing out clean bills to companies like Hyflux. Accordingly, Singaporean investors would have been far better off and far better guarded. That is also why we seek to lead by example. If we present a case study, it is our money and our skin that was in the game. In our first article, we showcased one case study where we achieved 153% gains on a deeply undervalued stock. That stock fell under our Conservative Net Asset Valuation Strategy (CNAV), otherwise known as our value strategy. We discussed how we found it, whether to buy it, why we held it despite it making losses, and when we decided to sell it to achieve 153% gains. We went through the entire thought process, step by step, in as methodical a manner as we could in order to help provide a framework and guide for you to follow. It is our hope that in learning from it, you can achieve better returns. How Did We Find Hisense Home Appliances(HA)? Hisense HA originally popped up as a potential investment under our Gross Profits Assets Dividend (GPAD) Screener. The GPAD strategy relies on relative valuation, unlike the absolute valuation used in the CNAV strategy. This means that knowing how profitable, and how much the dividend yield of the stock is alone, is not sufficient in telling us whether to buy or sell the stock. We would need to rank it against its peers to see if it was in the top 20 percentile before investigating any further. If we’re going to invest our money, it only makes sense to invest it in the company that is in the top 20% of the market in terms of profitability and dividends paid. The numbers alone will help us strip away biases and remain cognitively sharp and attentive to what matters: company profitability, and it’s dominance amongst other companies (by virtue of their position), and their cheapness by virtue of their dividend. Their higher dividend yield – since dividend yield is a function of dividends over share price – would indicate that it is cheaper to own. To accomplish this, all of the stocks have to be calculated and ranked in the stock exchange for this strategy. Do not panic. It is not difficult. 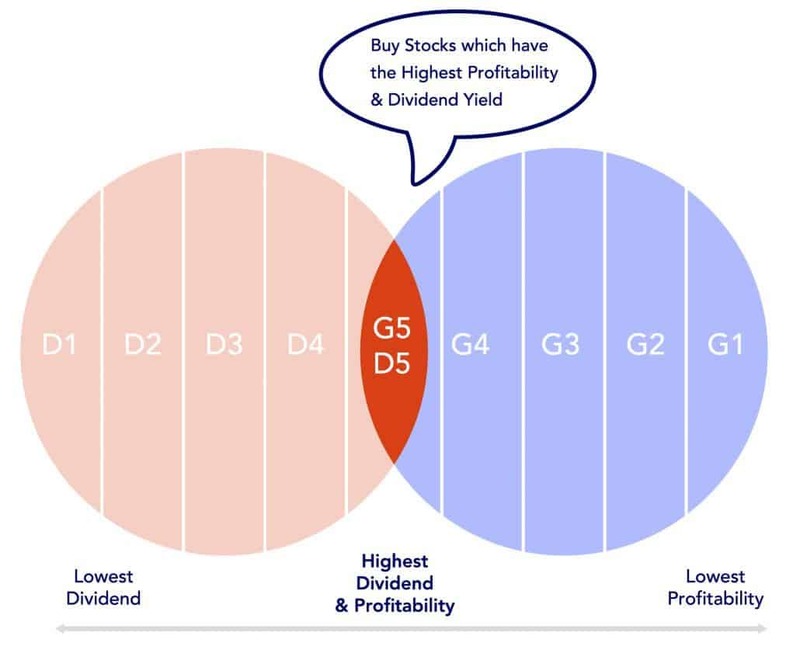 Simply take the range of the dividend yields and profitability (which a screener can show you) and divide it by 5. G1 represents the 20% of companies with the lowest profitability. G5 represents the 20% of companies with the highest profitability. D1 represents the 20% of companies with the lowest dividends. D5 represents the 20% of companies with the highest dividends. Its ok if you find it slightly confusing. We investigate further only if the stock falls into this category for both profitability and dividend yields paid. If it does not pass this criterion, we do not bother even investigating further into it. Since Hisense Home Appliances passed this test, we naturally moved on to investigate further. Here’s how we did it. I will use a simple analogy here to explain my thoughts. Free cash flow is like your savings for the year. Your salary is your income. Your needs to survive as a human being, paying bills, buying food, transport, entertainment, are your expenses. To a business, it’s savings for the years are its free cash flow. Dividends should almost always be paid out of free cash flow. 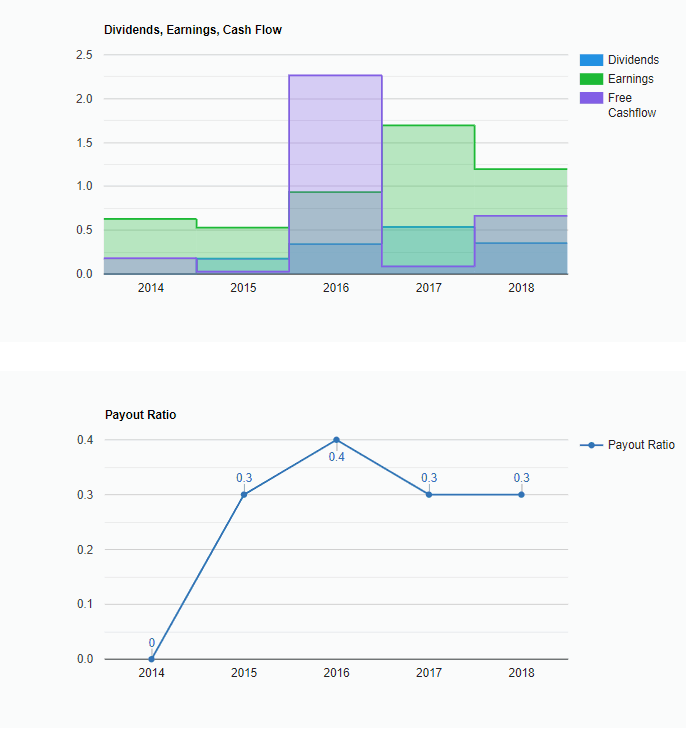 If free cash flow becomes negative for several years running, but a company keeps paying dividends, we can be sure that the source of the dividends is either taken from savings from previous years (which is damn jialat), or from borrowed money (lagi more jialat). Both of which over time will continue to erode the net worth of a company, and which will likely correspond to a drop in its share price. This cascades down to us as shareholders. Notice that (with the exception of 2017) the free cash flow per share always covers the dividends per share reasonably well. This verifies a sustainable dividend pay-out. Further, if we average free cash flow/dividends, the result is more or less close to the line of average. We also need to watch how much of the net income is being paid out as dividends. Ideally, it is not one. A payout ratio of one means that all net income is being paid out as dividends, which implies a lack of growth…in a growth stock, or some amount of financial engineering we do not want to be a part of. It’s fine if its a one-time thing, but we do not desire a company that does this repeatedly (the same goes for free cash flow!). Hence it’s important to watch what we call the payout ratio. Payout Ratio less than 1. Here is Hisense’s Payout Ratio. As seen, Hisense passes these tests. But what about their business? How do we tell if the business is worth investing in qualitatively? Or as Warren Buffet would put it, what is Hisense’s moat? We probably would have noticed the Hisense TVs in some discounted electronics sections. We were also told that the Hisense brand is quite common in Australia but we have not verified that. But we do know it got a lot of attention during the World Cup 2018 in Russia as a key sponsor. How did you feel when you saw Mbappe score in the final? And would consumers be able to translate the positive feeling to the brand because of the simple association? I bet there’s some effect for some people. China is undisputedly a wealthy country now. The middle class affluence is also rising at the same time and we expect domestic consumption of goods and services to go up. Home appliances and electronics products are likely to make their way into the Chinese homes too. Gone were the days where Japanese products are the default choices. Now the Koreans do it better with Samsung and LG. But nationalistic spirit is strong in China and we can see they easily boycott foreign products wherever their race and nationality were challenged – Lotte supermarket had to close down many stores after South Korea deployed more missiles to defend themselves. Dolce & Gabbana bosses had to make a public apology for a racist advertisement or lose the Chinese business. Hence homegrown products like Hisense would fare better domestically without the foreign stigma. We also started to see more Chinese products being introduced into foreign markets at the same time. Huawei is a good example such that politicians needed to step in to stop them from spreading the influence. The Belt and Road initiative would also help to speed up the adoption of Chinese brands and culture. In other words, the growth potential for many of these Chinese brands are tremendous, both domestically and internationally. But Hisense has its competitors, namely Midea, Gree and Haier. In fact, Midea and Gree are the largest in terms of market share in China. 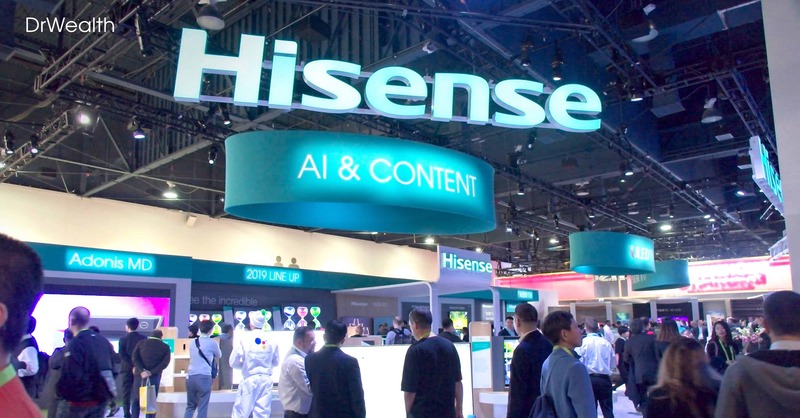 The only reason we chose to invest in Hisense was because it passed our numbers, suggesting strong fundamentals and the inexpensiveness of owning its shares. Preferably, our exit plan is never, our holding period is forever, and we only ever sell when the fundamentals of the company has deteriorated. Hisense HA passed HK$12 and the steep climb gave us some discomfort that it may not be sustainable. The price history has also shown that Hisense Home Appliances is a volatile stock which can go in either direction anytime. That said, their 2018 revenue grew 7.5% to RMB 36 billion but the net profits were lower 25% to RMB 1.5 billion. The dividends per share had also gone lower from RMB 0.44 to RMB 0.303. This means that the new dividend yield would be about 3% based on the current price of HK$12.20. The implication is that the dividend yield rank will deteriorate to D3 which is one of our exit points. We exited our position on 08/04/2019 at HK$12.10. Our buy-in at HK$8.42 means a neat gain of 43%. The remainder of the 5% profits were derived from dividends received. We did not sink in large amounts of time, or effort to churn out stock ideas. The research that validated Hisense Home Appliance as an investment idea was done in approximately 30 minutes. We did not have a head researcher with a Phd in Rocket Science. We did not have a team of analysts. We did not spend two weeks researching this stock. 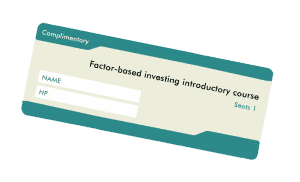 We based our investment idea on sound company fundamentals guided by academic research. We stood on the shoulders of giants, and reached further to gain greater returns. Most importantly, we believe that if we can do this, then you can too. We believe in leading by example. In following a framework. In using numbers to remove cognitive bias. In being rule-based. That’s the way we operate. 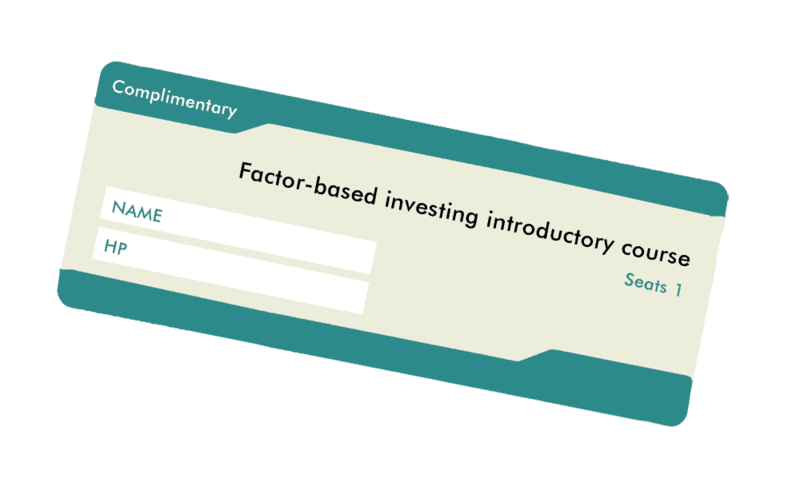 If you would like to learn how you can do this for yourself, we would like to invite you to click this link to join our free Factor-Based Investing Workshop. Thanks for this educational article! I would like to ask what stock screener are you using, that shows the free cash flow over the years (shown in the screenshot in the article)? I keep reading that free cash flow is very important but am not sure where to find this info, other than calculating it myself. We are using our own internal screeners. Getting free cash flow data for individual stocks is easy. But finding screeners to filter stocks based on x number of years of positive FCF is not. I know you can do that with ShareInvestor.com [paid]. Just checked, you can do that with https://stocks.cafe as well. I thought DrWealth declare avoid s-chip. Hey Jo, as John rightly pointed out Hisense is not S chip. S chip is Singapore listed China company. Hisense is a Hong Kong listed China company. Most importantly, GPAD (Gross Profitability Asset Dividend) allows us to buy China stocks because there are dividends, which make us trust the figures more. We would not be buying China stocks if we can’t reliability determine the existence of cash or assets on the balance sheet. That’s why we avoid China stocks on our CNAV (value strategy) since there’s no way we can tell whether the asset figures on the statement is real or not.